Hell's Fury offers the brightest petunia combo mix ever! 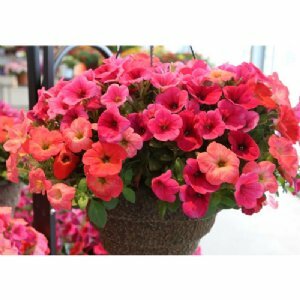 This combination contains two neon petunias, Hells Fruit Punch and Hells Glow. The combination of these two colors is simply outstanding! Everyone will notice this flowering combination. The plants in our 'Hell's Fury' plants are grown and shipped in fine quality growing medium and are guaranteed to arrive alive and ready to thrive.